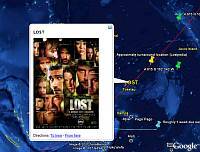 The popular TV show LOST, about the survivors of a plane crash on a remote island believed to be in the Pacific ocean, has not yet revealed the location of the island in the fictional story. That hasn't stopped fans from speculating. The JoshMeister LOST blog has posted his speculations about the possible locations and created a file showing the possible locations for viewing in Google Earth (if you need to download Google Earth click here). 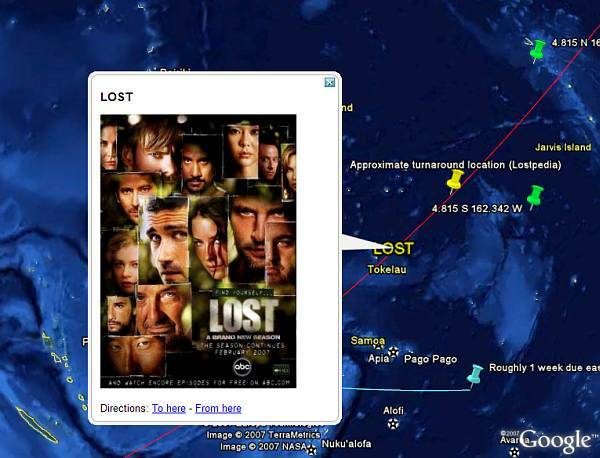 Josh's speculations show one location between Pago Pago and the Cook Islands, and other locations near Jarvis Island or the Kirbati islands. Read his post for details using descriptions and clues from various episodes on how he arrived at the estimated locations. The location map can also be viewed in Google Maps (courtesy of KML support by Maps). via InsideGoogle. I think they're in Purgatory "a place or condition of temporal punishment". Well anon, considering the writers have debunked purgatory a billion times, you might be right.